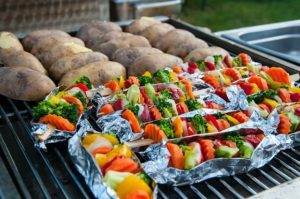 If you love to grill food for a crowd or like having room on your grill for several different types of foods at once, you need a fairly large grill – like one of these best 4 burner propane grills of 2019. Gas grills with 4 burners give you a lot of cooking space (somewhere in the 500 – 700 sq. in. range, give or take), and generally come with some pretty sweet features that give you tons of versatility. Having the right gas grill can help you really enjoy your cooking experience and create some memorable meals. I’ll show you what you need to consider when making your choice – after you’ll see my top picks for this year. I’m sure by the time you’re done reading you’ll see a 4 burner propane grill that you’ll love. If you’re sold on the big, convenient size of a 4 burner grill already, what else do you need to know in order to pick out “the best” one for YOU? Not everyone needs the highest end option, and not everyone simply is watching for the lowest dollar sign. You’ll find that the grills on the top end of the market are made out of a very high grade stainless steel. And I’m not just talking about the grill grates… the majority of the grill is stainless. Stainless burners, solid stainless burners, stainless flavorizer bars and flame tamers, stainless side prep tables, stainless cart, stainless everything! And why stainless? It’s the most rust and corrosion-resistant material for grills, meaning that your grill and its parts will last you a long time. Which means great bang for your buck. While the “totally stainless steel” grills are fantastic, you do pay for it. Porcelain enameled or cast iron, or a combination of the three (stainless being the third) also make for a quality grill. I would recommend stainless steel burners at least though, as burners are expensive to replace and a pretty important part of your grill. Flavorizer Bars: The concept behind these is two-fold. 1) The drippings that fall through the grates are vaporized and turned into smoke that infuses your food with extra flavor, and 2) the excess drippings are safely channeled down to the drippings pan instead of making a mess of your burners. Bluetooth Ready: Some grills are set to connect with your smartphone so that you can monitor your meal from your patio lounger. The Weber Genesis is an example of this (iGrill3 ready). Rotisserie: Because 4 burner gas grills are large, they have space enough for a decent rotisserie system with infrared/rear burner, and come with a motor already attached, and the spit and fork assembly. Side burner: If you like to be able to finish up all cooking for your meal outside, a side burner is great for making sauces and the like. Sear burner: A sear burner can get up some serious high heat to give a fantastic quick sear to your steaks. If you’re a steak lover, this might be an interesting and appealing feature. LED lighting: Grill a lot at twilight or in the evening? You might appreciate lit up controls and even lights inside your grill. Tank gauge: There’s nothing more frustrating than running out of propane in the middle of your cooking, especially if you don’t have a full spare. A tank gauge will let you know how much is left in your propane tank. Tuck-Away or foldable warming rack: While pretty much all grills have a warming rack these days, not all of them are designed to be able to be easily pushed aside to give you better access to the whole cooking area. The Weber Genesis II is my top pick for a number of reasons, one being that you just can’t go wrong with a Weber! This company has a large range of grills that are ALL excellent and long lasting. The Genesis II is actually their “lower end” 4 burner grill, believe it or not, although it’s definitely not a “low end” grill. (See The Summit later on for their “higher end” 4 burner grill option). 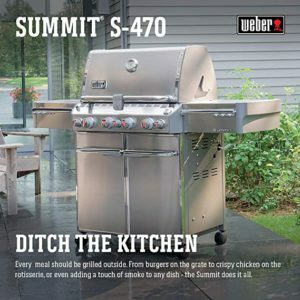 You get Weber’s extremely well received “GS4 Grilling System”, which includes: 4 high performance steel burners, flavorizer bars (that turn drippings into smoke that flavors your meat, but also channels excess drippings into the grease pan before they flare up), Weber’s Infinity Ignition starter (under guarantee that it will start EVERY time), and an awesome grease management system that is top-notch (it prevents flare-ups that burn your food and makes cleaning your grill really simple). Weber’s steel burners are not your average burners… they are specially designed for fantastic heat distribution over the whole cooking surface. You’ll notice that the burners have a unique tapered shape- this helps give consistent gas ﬂow from front to back. Consistent gas flow means consistent heat, which means your food gets grilled evenly no matter where on the grill you put it. Everything about it feels and looks heavy duty and sturdy, from the porcelain coated lid to the wheels and everything in between. It has a sleek-looking open cart design that gives you plenty of easily accessible space for your supplies and accessories (if you prefer, closed cart Genesis models are also available). The porcelain enameled cast iron cooking grates are reversible, giving you more options for cooking – the thin side is ideal for shrimp, fish, and other delicate foods, while the thick side is fantastic for adding searing marks that enhance the flavor of your steaks and the like. It has two stainless steel prep work-spaces with 6 hooks for hanging your barbecue tools and lots of space for your seasonings, sauces, and plates. The warming rack can be easily tucked/folded away if you aren’t using it so it’s not in your way during a big cook. For you techies who want to monitor the cooking of your food on your smartphone, this grill is iGrill3 ready! It comes with a fuel gauge that keeps you up to date on how much propane is left in your tank; there’s nothing worse than getting get caught by surprise in the middle of a grilling session, is there? As you can see, there’s a TON to love with the Genesis II grill. 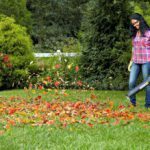 Weber guarantees it for 10 years as well, which means that they are pretty confident they are selling you a sturdy, well-designed, quality piece of equipment. It does come with a pretty significant price tag, however. I think it’s worth it, but if you’re looking for something a bit more affordable, there are plenty of good 4 burner gas grills to come that are a bit easier on the wallet. 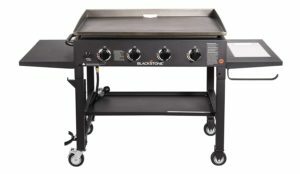 This next grill is my top choice for a more economical 4 burner gas grill. 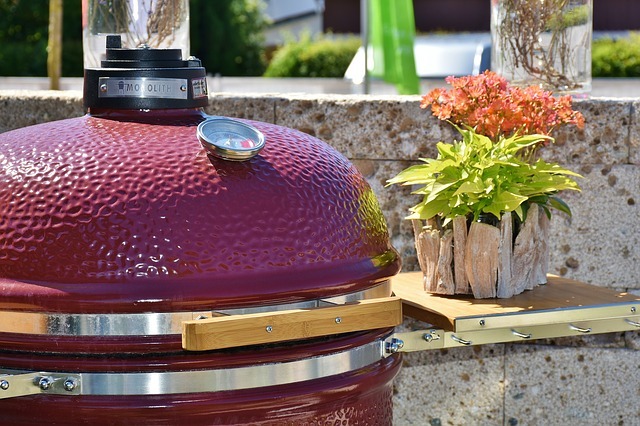 Monument Grills has a few different options with different special features (we looked some further on this list), but this model with the rotisserie is a popular one that is well worth a few minutes of your time. It’s a grill made with a LOT of stainless steel – the cart, rotisserie, tool hooks, grill lid, and burners and more. Reviewers are amazed at how sturdy it feels for the price point. The grill also comes with stainless flame tamers that will limit flare ups that can spoil/char your food. The cooking grids are made of heavy duty porcelain cast iron (one of the only parts NOT stainless steel). The rotisserie (which comes with the required motor kit) can be removed when not in use so it’s not taking up your valuable cooking space. The 4 burners come with an 8 year warranty. Often with grills you find you need to replace the burners after 3 or 4 years, but with this Monument grill, you can be sure you’ll get at least 8 years out of your purchase. Not bad! Customers report that it was very easy to put together, with decent instructions. This next grill is for those of you looking for a seriously high end 4 burner propane grill. This grill actually can come in two separate parts: the grill head and the base (in case you want the grill head only for an outdoor built in kitchen). One of the big differences you’ll notice about the Bull Angus grill is the quality of the build – it’s made of pretty much the thickest and highest grades of stainless steel available to the grilling industry: 14 gauge 304 stainless steel. 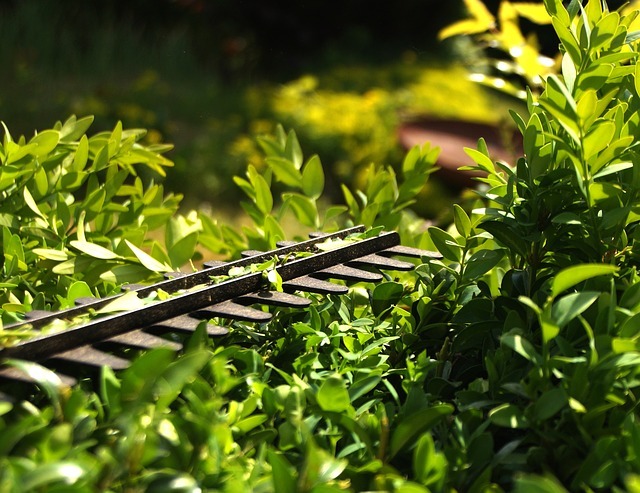 It’s incredibly rust and corrosion resistant, aside from making it a sturdy and heavy duty grill. The dual-lined roll-top hood has seamless welded edges, and you’ll be pretty amazed at just how well this thing holds the heat inside. The cooking grates are solid 304 stainless steel. These will seriously last a lifetime… they’d better, because they are guaranteed for life. Every burner has it’s own Piezo Igniter, and each igniter is protected by you guessed it, stainless steel housing (so that drippings can’t interfere with sparks and wires). 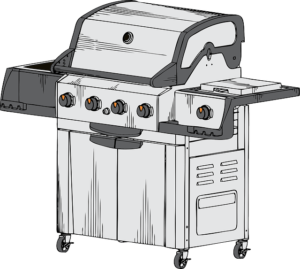 The grill has flame tamers to ensure even and consistent heat distribution without flareups, a full length stainless steel handle that remains cool to the touch, an easy-to-remove full size grease-tray, a twin lighting system, and much more that you’ll love! Because this is a grill that will pretty much be written into your will (it’ll last forever and is seriously something your kids will really fight over), it’s good to know that you CAN convert it over from liquid propane to natural gas hook up if there comes a time when that’s available. It includes a top quality rotisserie system and infrared rear burner that you can use to cook up some special cuts of meat for your family and friends. The Bull Angus 4 burner grill is pretty amazing – and if you choose to get it, it’ll likely be the last gas grill you ever buy. (The lifetime warranty on the burners, grates, and fire box make that a real possibility.) Yes, it’s a hefty price tag. 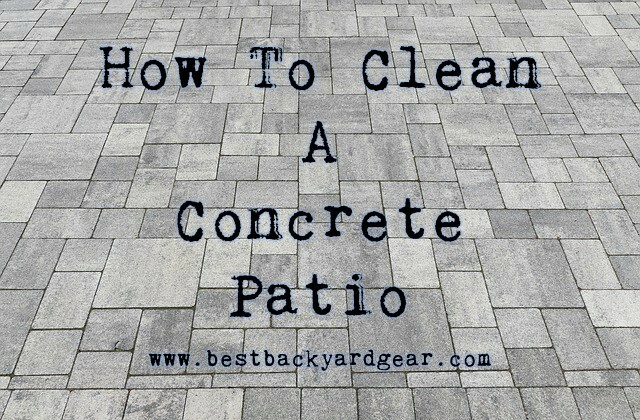 But if you can swing it, it sure will look good on your patio. Grilling area: 647 sq. in. This next grill is another high end or “premium” grill, so feel free to skip on to the next if you’re wanting something budget friendly. If you’re able to afford this one though, you’ll be set for decades to come with a grill that I think you’re going to rave about. 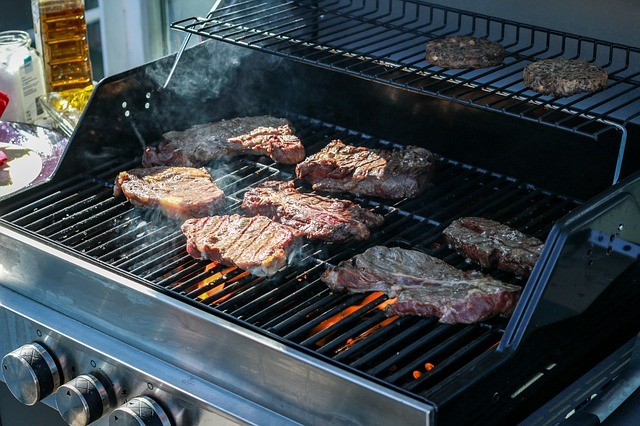 It’s made all around of commercial grade 304 stainless steel, the best you can get in the grilling industry (like the Bull above). You’ll definitely appreciate how solid and unbreakable this grill is… and how sharp it’ll look for years to come. The grill head (lid) is a double layer, seamless welded, stainless steel contraption with polished edges; perfect for keeping the heat nicely inside the grill. It has two built in interior lights so you can keep an easy eye on your food no matter what time of night you feel the need to grill something. The 4 burners are made from cast stainless steel, giving excellent heat control so you can cook evenly and with precision. Lion Premium Grills adds their “gourmet package” to every grill, which gets you some fancy extras that many grilling affectionados will appreciate: the grill head cover, griddle plate (make pizza or breakfast! ), griddle plate remover and bottle opener tool, smoker box and the rotisserie kit. Another small extra is the paper towel holder that’s built into the storage area in the cart. Many of you will also appreciate that this premium grill is made in the USA of US stainless steel. 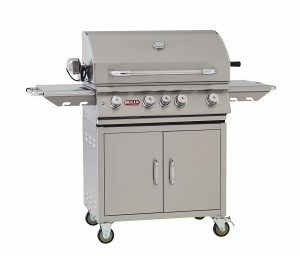 Customers rave about the high quality of these grills (see reviews on Amazon by clicking through), and I think if you go with a high end grill, this or the Bull Angus above would both be excellent 4 burner propane grill choices. The Lion has a few more bells and whistles, and comes at a cheaper cost though, so take a good look at it. Grill Cooking Area: 513.3 sq. in. Warming Rack: 210 sq. in. We already saw a pretty basic but really well reviewed Monument Grills entry in this “best 4 burner gas grills” list – now we’re taking a look at a grill by the same company with a few more bells and whistles. It comes with both a regular side burner for cooking sauces and side dishes as well as a second ceramic side burner specifically for searing, which you’ll love for cooking those meats that you want to seal in the flavor with a quick sear before a slower, lower cook. 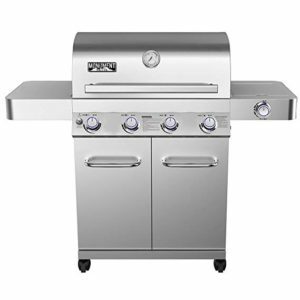 It comes with a one year full warranty on the grill, and 8 year limited warranty all off the (304 stainless steel) burners. Heads up, it does NOT have the rotisserie feature, but it does have the LED lit controls. This particular grill is another really attractive option for those of you trying to get a big gas grill under $500. Customers give it good reviews overall, considering it great bang for your buck. Sturdy, solid materials, flame tamers, porcelain coated cast iron grids, easy to clean up, pretty easy to assemble… what more do you need if you want a good grill for an economic price? Grill Cooking Size: 468 sq. in. Warming Rack Size: 112 sq. in. We’ve already seen Weber’s “cheaper” 4 burner grill (The Genesis II) above, now let’s take a look at the Summit, the model that Weber calls “their crown jewels”. It’s honestly pretty drool-worthy. It’s made from high grade stainless steel throughout, including 9mm diameter solid stainless steel cooking grates, single weld stainless steel burners designed to resist rusting, and stainless steel Flavorizer bars (which help both turn drippings into smoke that infuses your food with flavor, and channeling extras away safely). Each burner has it’s own Snap-Jet burner ignition system so you can play with heat zones and indirect cooking. You’ll love the versatility of this grill! There are so many options for different types of cooking as it comes with 4 main burners (48,800 BTUs total), a flush mounted side burner (12,000 BTUs), a sear station burner (10,600 BTUs), a smoker burner & stainless smoke box (8,000 BTUs), and rear-mounted infrared rotisserie burner (10,600 BTUs – you can tuck away the rotisserie motor when it’s not in use, and use the designated storage spot in the cart for the spit and fork). With a push of a button, you can tell exactly how much propane is left in your tank as it’s set on a scale and the LED control panel will let you know what’s left. 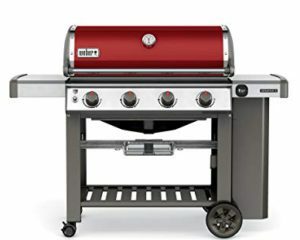 There are lots of extras that come with your grill, including two stainless steel work surfaces, LED lit control knobs and front mounted control panel, 6 tool hooks, a Weber cookbook, a built in thermometer, chrome plated cast aluminium handles, easy to remove grease tray & drip pan, and heavy duty wheels and locking casters so you can move this heavy grill quite easily. It also comes with a natural gas conversion kit should you change your mind about your selected fuel source in the future. Ultimately, a grill is a tool used for cooking. If you’re the kind of person who wants solid, quality tools, this is a great choice for you to look at. It’s a serious grill, for serious grillers who expect high end performance. Grill Cooking Area: 500 sq. in. Warming Rack Area: 195 sq. in. 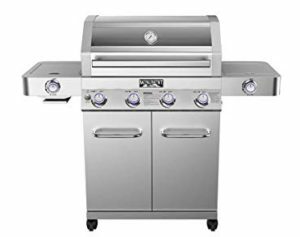 This next grill is a 4 burner propane grill option made in North America by Broil King, and it’s available in either stainless steel (pictured), or black painted steel. The 4 stainless steel burners are Broil King’s patented Dual Tube style, meaning you get great heat distribution as there are two rows of flames per burner (you’ll appreciate the 10 year warranty on them too). Replacing your empty propane tank with a full one is easy as this grill has a convenient tank pull-out drawer. 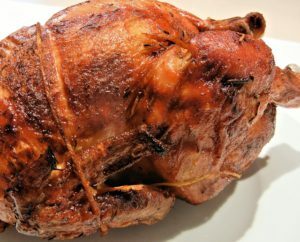 You can look forward to great slow cooked cuts of meat done by rotisserie as it comes with a premium rotisserie motor and spit rod, and has a powerful 15,000 BTU rotisserie burner. The cookbox is made from die-cast aluminium and high grade stainless steel; you can expect fantastic heat retention inside the grill and expect it’ll last a very long time (the grill DOES have a limited lifetime warranty)! This Broil King grill has Flavorizer bars much like the Weber ones – the “Flav-R-Wave system” protects the burners and also vaporizes drippings, turning them into smoke that infuses your food with fantastic flavor. 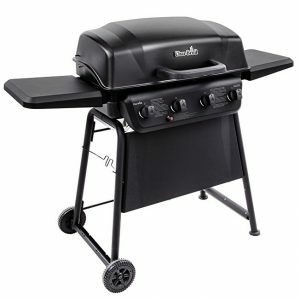 The Broil King Regal S490 has both style AND function and is a pretty attractive grill – and also “pretty attractive” is the fact that (currently) Amazon provides free assembly of this grill. That’ll save you approx 3-4 hours and perhaps some frustration, getting you cooking up something awesome in no time. Grilling Space Area: 405 sq. in. Warming Rack Size: 190 sq. in. 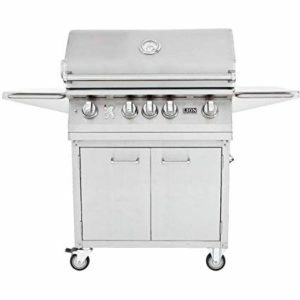 When you need a large grill but just can’t invest in a longer term and/or higher end model, this large and very inexpensive 4 burner propane grill by Char-Broil is the one you probably want to look at. Definitely the least expensive on this list, yet it still has quite a few really good reviews. You get 4 stainless steel inline burners that give you a total of 32,000 BTUs of heat. It’s not quite as high “power” as most of the other grills, but it can still cook some serious food for a crowd, don’t you worry. The lid and firebox are porcelain coated steel, able to stand up decently to weather and the elements. The cooking grates are porcelain coated as well, and you’ll find that they are easy to clean and resist sticking to your food. The cart includes to metal prep spaces and a cart with two 6-inch wheels and two fixed legs that it’s pretty easy for you to move it around your patio if you want to. The warming rack can be easily swung out of the way if you need the full space on the cooking grates for your meal. This really is a basic grill, and actually, you will find it a bit “small” compared to other 4 burner grills. It has no extra bells and whistles, such as side burners, rotisserie motors, took hoods, or what not. But you also don’t PAY for those. This is a decent, simple grill that can get the job done, cooking a lot of food at once. And it’s very affordable. Grilling Area: 720 sq. in. This last entry here is a bit of a different idea – an open top grill that also can function as a griddle. This Blackstone grill is a restaurant grade/professional quality grill that is designed to cook all sorts of foods, from steak and burgers to quesadillas and teppanyaki style foods and from pancakes to eggs. It’s a LARGE grilling space, able to cook for a serious crowd – which may be a big selling feature if you’re looking at 4 burner grills specifically with big batch cooking in mind. There are two side shelves, and one has a removable cutting board! There’s a convenient paper towel holder to give you easy mess clean up, and even trash bag hooks so you can dump your egg shells easily when cooking breakfast for your crew. It’s incredibly easy to start – just push the battery powered ignition and presto, a few minutes of heating later, you’re in business. This grill is made from serious quality materials, including thick cold rolled steel for the cook top, stainless steel burners, and a black steel frame. The wheels are heavy duty as well, so you can roll this grill around with you easily. And the fold-up legs and removable griddle top make it really portable too. You may find that you really love cooking on a flat top, as you can get the crisp from the high heat, but still keep the flavor and juices in your foods. It’s a bit different than a traditional propane grill, but I think it’s still worth showing as a serious option for 4 burner propane grills. Whether you’re a backyard griller cooking for a large family or party, or someone who caters or likes to cook a lot of leftovers (who doesn’t want leftover grilled chicken? 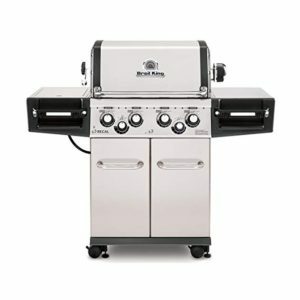 ), one of these best 4 burner propane grills of 2019 is bound to be a good fit for you. We saw high end, high priced grills that are pretty much investments towards fabulous grilling for the next few decades, mid-priced 4 burner gas grills that do the jog with style and excellent function, and some entry level models that are priced nice and low. Hopefully one of these was a great fit for you, and that you were able to pick out something that you’ll be really happy with for the foreseeable future. Don’t forget, one of the great things about 4 burner propane grills is that you have a LOT of usable space, which gives you options. You can fire up the entire grill to cook for a crowd, just one or two burners to make a small meal, or use indirect heat to cook something special. Add in a rotisserie and side burner, and you’ll be seriously set, unless you want to get into specialized equipment like digital electric smokers or outdoor pizza ovens. But in my opinion, you can get these grills to work in a pretty similar fashion if you know what you’re doing and tweak things a bit. 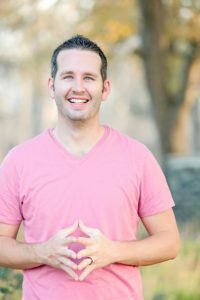 Anyhow, as always, if you have any questions, feedback, or general comments, I’d love to hear from you in the comment section below – I’ll be sure to get back to you quickly!